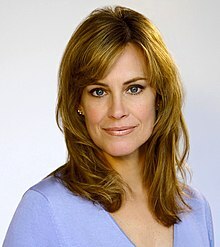 Catherine Mary Stewart (née Nursall; born April 22, 1959) is a Canadian actress. Stewart was born on April 22, 1959, in Edmonton, Alberta, the daughter of Mary (Stewart) and John Ralph Nursall. Her parents taught at the University of Alberta, her mother a physiology teaching assistant and her father a biology professor. Stewart attended Strathcona Composite High School. Stewart began her career as a dancer and moved to London, England to study at age 18. There she landed a role in The Apple, a 1979 musical science fiction cult film. After moving to Los Angeles she obtained a role on the soap opera Days of Our Lives, playing the original Kayla Brady from January 1982 to December 1983. In 1984, she starred in two science fiction feature films, The Last Starfighter as Maggie Gordon and in Night of the Comet as Regina Belmont. She later played a leading role in the teen comedy Mischief. In the mid-1980s, Stewart appeared in two miniseries: Hollywood Wives (1985) and Sins (1986), where she played the younger version of Joan Collins's character. She made guest appearances on television series such as Knight Rider, Hotel, Alfred Hitchcock Presents and The Outer Limits. She starred in several made-for-TV movies such as Murder by the Book (1987), Passion and Paradise (1989), Perfect Harmony (1991) and Ordeal in the Arctic (1993). In 1989, she appeared as Gwen Saunders in the comedy film Weekend at Bernie's..
Beginning in the mid-1990s, she scaled back her appearances whilst she was raising her family. Recently, as her children have grown, she has again been appearing in TV and film roles, and has expressed an interest in directing. She is the sister of Alan Nursall, scientist and media personality who reports on science news for the Canadian TV series Daily Planet and the Discovery Channel. Another brother, John Nursall, is a freelance writer and TV/film documentary director and producer. She was married to actor John Findlater in 1983 and divorced in 1985. She married Richard Allerton in 1992. She has a daughter and a son and currently lives in Brooklyn, New York. 1982 Mr. Merlin Daisy Willis Episode: "Everything's Coming Up Daisies"
1983 Knight Rider Lisa Martinson Episode: "Brother's Keeper"
1985 Hotel Lynn Valli Episode: "Promises"
1987 Alfred Hitchcock Presents Rachel Jenkins Episode: "Tragedy Tonight"
1996 The Outer Limits Joanne Sharp Episode: "Unnatural Selection"
2001 The Outer Limits Brooke Miller Episode: "Family Values"
^ "Catherine Mary Stewart Biography". CultCelebrities.com. Retrieved 10 February 2019. ^ a b c "Catherine Mary Stewart-Biography". TCM.com. Retrieved 7 February 2013. ^ ""John Colin, Alan Stewart, Catherine Mary" - Google Search". www.google.ca. ^ "Catherine Mary Stewart Biography (1959-)". www.filmreference.com. ^ a b c d e f Brownlee, Kristy (June 2013). "Girls Just Want to Have Fun". Avenue Edmonton Magazine. pp. 100–107. Archived from the original on July 10, 2014. Retrieved July 29, 2013. 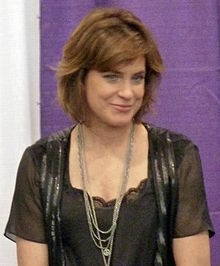 Wikimedia Commons has media related to Catherine Mary Stewart. This page was last edited on 22 April 2019, at 16:04 (UTC).